Home → Blog → What Is Passive Design? You may have heard the term “passive design” but what does it actually mean? Basically passive design means utilising free renewable sources of energy such as the sun and the wind to heat, cool, light and ventilate your home. Passive design can help minimise temperature fluctuations in your home, reducing the need to use energy on heating, lighting and cooling. If you think back to the early houses built in New Zealand they were generally constructed to look attractive from the street frontage but often the main living areas were cold and dark. The great thing about building a new home today is that we are much more mindful of the importance of incorporating passive design principles into our homes. All it takes is a bit of thought at the design stage. To make the most of passive design, we need to have as many windows as possible facing north to capture the sun, and keep south-facing windows to a minimum. Our Nikau plan is a great example of this principle. Our Clearwater design is another good choice as it has high north-facing windows in the living room with a covered patio outside. This combination allows for maximum solar gain in the winter when the sun is lower but helps block out the sun in the summer to stop the home from getting too hot. Above: The Nikau exemplifies passive house design through its north facing windows. Thermal mass is an excellent way of capturing free heat from the sun in winter and storing it inside the home to be slowly released. An exposed concrete floor acts as a thermal mass and is an economical option that you may wish to consider. The cost is approximately $7,000 for a smaller home and up to about $12,000 for a larger house. The polished concrete floors must be left uncovered to achieve the thermal mass, which means that you will not need to purchase or install carpet, vinyl or tiles. As well as saving you money on future heating bills, polished concrete floors make a stunning feature as you can see from this Canterbury home pictured, which our team recently completed. 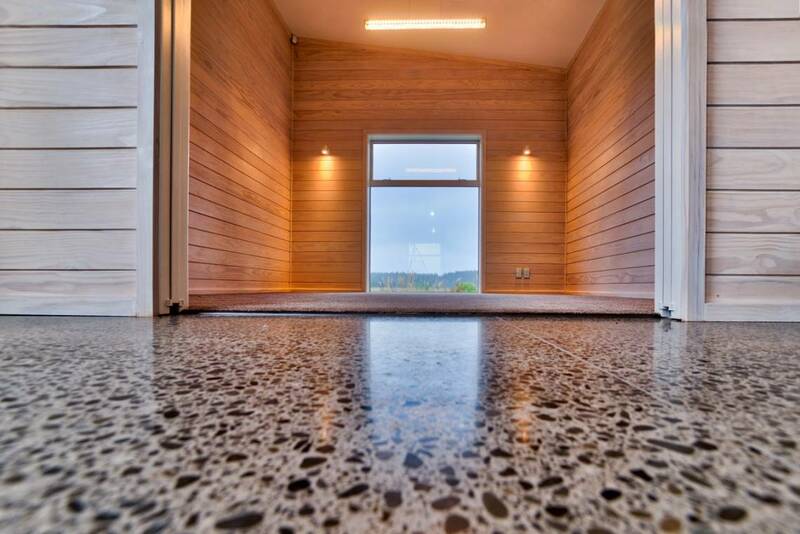 Above: Polished concrete floors in a home we recently built both look great and achieve tremendous thermal mass. They even cost less than other flooring options! An added advantage is that concrete floors are very hard-wearing and can survive pretty much anything a family or pets can throw at them! There are many things to consider with passive design and thermal mass, such as the orientation of your building site, placement of windows in your home and provision for shading. Our skilled consultants can discuss this with you and help you include the best ideas for your home and budget in your home’s design. That way you can make sure you are getting heat when you want it and keeping the heat out when you don’t! If passive design is of interest to you, be sure to get the 2018 Sustainable Building Report, available here.